For the sauce: Whisk all ingredients together in a bowl. For the chicken: Combine the cornstarch and flour in a large bowl. Whisk together the egg, salt, and pepper in a medium bowl. Add the chicken pieces to the egg mixture. Place the coated chicken into the cornstarch mixture. Stir to coat the chicken well and shake off excess cornstarch. Heat about 3 tablespoons coconut oil in a large heavy skillet over medium-high heat. Add the chicken to the skillet. Fry until golden brown on the bottom, about 3-4 minutes. Flip the chicken pieces and fry until the other side is golden brown, another 3 minutes. Transfer to a plate. Add more coconut oil to pan and repeat with remaining chicken. Heat 1 tablespoon coconut oil in the same skillet over medium heat. Add the garlic, ginger, and red pepper flakes, and cook for about 20 seconds. Give the sauce a quick whisk and add to the skillet. Bring to a boil and cook until the sauce thickens, about 2 minutes. Add the chicken and stir to coat with the sauce. 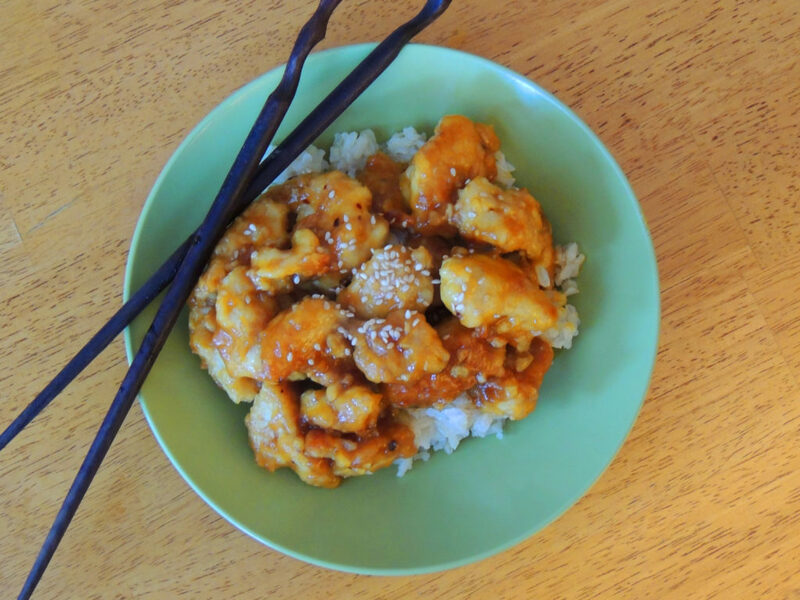 Serve with rice and sprinkle with green onions and sesame seeds.